According to a new study done by researchers from Duke University, air pollution can increase the risk of obesity and diabetes in humans. The study was done in Beijing with lab rats that were exposed to Beijing’s incredibly dense, polluted air. After three to eight weeks, the lab rats gained weight and had cardio-respiratory difficulties. The results were analyzed against lab rats that had not been exposed. In 2015, China’s capital issued two red alerts in two weeks because of elevated air pollution levels. The red alert is the highest level of air pollution ranking the country has in its air pollution response system. The study, appearing in the March issue of the Journal of the Federation of American Societies for Experimental Biology, used two sets of lab rats in their research experiment, each group in a different enclosed space. One group of pregnant lab rats and their offspring were exposed to the polluted air; the other group was placed in a chamber that had an air filter removing the pollutants. Nineteen days into the experiment and it was already evident that the lungs of the rats exposed to the polluted air were heavier and showed signs of inflammation, whereas the rats in the clean-air chamber did not present such results. Both male and female rats were 10% and 18% heavier, respectively, than the rats that weren’t exposed to pollutants. This confirms the study’s theory that pollution does in fact disrupt the body’s systems, contributes to weight gain through insulin resistance (which a precursor to type 2 diabetes), and contributes to inflammation in organs and the circulatory system. All lab rats were fed the same amount of food. The results of the study, which was funded by numerous agencies in China, reiterate the findings from other studies that have come to similar conclusions stating that pollution is a contributing factor to obesity. The hopes is that such research will provide the impetus needed to reduce pollution emissions all over the world but with particular emphasis on countries severely crippled by the massive clouds of pollution that hover over their cities. Even though 4,000 people die per day from air pollution in China, China is not the worst offender—India is ranked as the world’s most polluted country in terms of air quality. 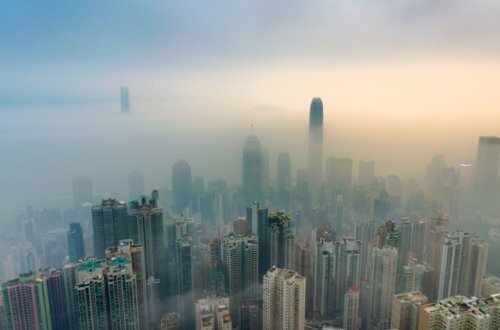 If carbon dioxide emissions can be reduced to acceptable levels or better, much of China’s air pollution problem could be resolved. Wei, Y., et al, “Chronic Exposure to Air Pollution Particles Increases the Risk of Obesity and Metabolic Syndrome: Findings from a Natural Experiment in Beijing,” Journal of the Federation of American Societies for Experimental Biology, March 2016, doi: 10.1096/fj.201500142.